- use a grow room with a stable temperature of 20 degrees Celsius. - use soil with a pH-value of ± 7.0. - the soil should not be too dry or too wet. - sow the seeds in a container about 5 mm deep. - after sowing press the earth lightly, this stimulates even sprouting. - spray the soil lightly with water. - cover the container with thin transparent plastic foil to achieve an optimal greenhouse effect. - after 1 to 10 days the seeds will have sprouted. Now remove the plastic foil. - sprinkle the soil regularly with water, wait till the upper layer has dried out, and sprinkle again with water. after 1 - 2 weeks the seedlings will be strong enough to put them in a larger container. We do not take responsibility for seed germination. 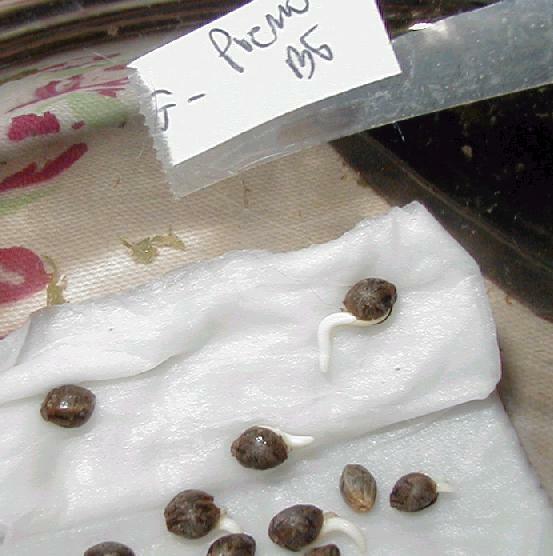 We do seed germination tests every 3 months to keep our seed stock in optimum condition. All seeds from our collection are grown organically.